Times are changin’ – literally and figuratively. Yes, we’re moving into 2015, switching over our calendars and preparing ourselves for another countdown. But the countdown we should really be paying attention to is the countdown to a very, very new Facebook (at least where marketers are concerned). We’ve talked about this before – organic reach on Facebook (and soon other networks) has already decreased for most brands. But in January, Facebook plans to make an even more substantial change to its algorithm (not EdgeRank anymore), significantly decreasing organic reach for any Facebook content that is deemed as promotional in any way. If it looks like an ad, smells like an ad, reads like an ad, you’ll have to pay to ensure that users see it starting in January 2015. Here’s the deal. 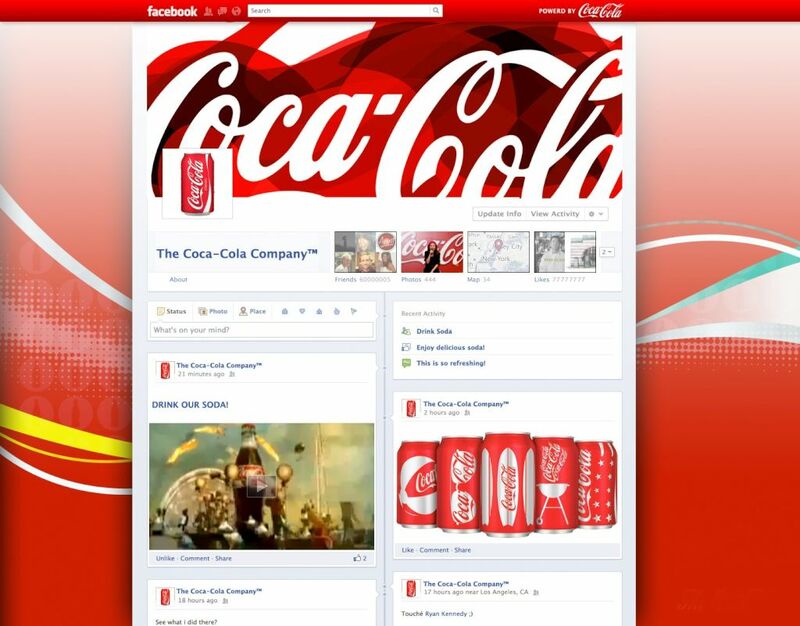 Facebook reports that an average of 1,500 stories are generated each time someone logs in. Of those, a user’s Newsfeed only displays around 300. And its algorithm is the deciding factor as to which stories you see – it filters based on factors relative to what each user likes, their clicks, articles they’ve commented on, etc. Facebook constantly makes updates to its algorithm, however this recent change is one of the most substantial updates they’ve made so far. In effect, Facebook is forcing marketers who often use the network as a means of promoting their contests, new products and events, to spend money on ads, if they want these messages to be seen (even by their existing followers). And, not only does Facebook want to control how & how many promotional messages users see, but they also want to control who sees them. If someone is going to see a promotional message, Facebook wants to make sure that it’s marked as such AND that it’s shown only to users who will find it highly relevant. 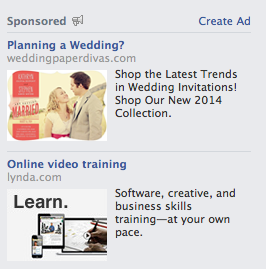 And the only way to do that, is by paying for an ad and selecting a very specific target audience. In theory, the more hyper targeted your ad’s audience, the more relevant the ad creative can be, the higher the engagement rate, and the more satisfied Facebook users will be. This is certainly great from a UX perspective. But for marketers, this means more money, more creativity and, our favorite, more time. And we’re a little suspicious of Facebook’s actual motives i.e. Facebook is likely looking to get rich quick (or wait, have they already done that?). Okay, so what’s all of this mean for YOU? You need a budget. No matter what you have planned for the next year on Facebook, if an ad budget isn’t a part of that plan, you need to start over. Facebook ads are no longer an option, they’re a requirement, especially if you want to increase your reach and amplify your promotional messages. Remember, if your post has any of the following involved it MUST be posted as an ad: contests, events, product-heavy, “buy this.” The specifics are outlined here. Get creative with your organic posts. You can’t post about a gift card sale. You can’t post about an event. You have to add value to people’s lives in some way. You have to provide quality content that’s creative, that makes people stop & think, and then share. Be relevant. If you want to increase your organic reach, you must increase your engagement rates. What’s the best way to do that? Talk about what matters. Have a point of view about trending topics and always think about what’s going on seasonally, and personally for your community. Measure. If you’re not already tracking your social metrics, get on it. You’ll need to ensure that both your organic posts and paid ads receive high engagement rates. Because this will be one of the biggest factors determining whether users will see either type of post. Now, you not only need to spend more money with Facebook ads, but you also need to spend more money reporting out on organic and paid content. Optimize. And what should you do with those reports? Use them as the basis for continual optimization. Use the insights to discover which content is best performing and replicate it. Do A/B tests with your paid ads to determine what’s going wrong with the ads that receive low engagement rates – is the creative off or is your targeting off? Or both? This is a lot to take in. Facebook and the constantly changing world of social media can be a bear. 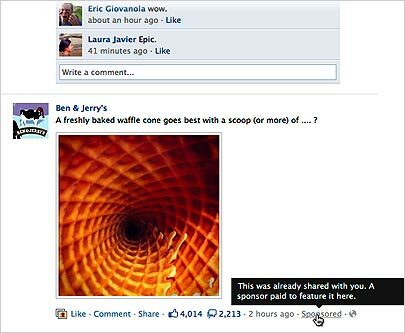 Fortunately brands who are already leveraging paid social will have a little easier time making this transition. They’ll just need to review their ad creative and optimize for the highest engagement rates and be sure not to post any ads to their wall as organic posts. But for marketers who have yet to explore the world of Facebook advertising, this may take some ramp up time and potentially some consultation with someone who knows the ins and outs of paid social. This entry was posted in Facebook, Facebook Advertising and tagged Facebook 2015, Facebook algorithm. In just a few weeks, Facebook will turn 10 years old. To put it differently, I’ve been using Facebook for a decade. Somehow it’s not even a teenager and it’s one of my best buds. But it’s not just a reliable pal, it’s also revolutionized the way the world communicates. Don’t get me wrong, Facebook didn’t go it alone, but it did give social media the mass appeal it now enjoys, paving the way for some of our favorite networks (Twitter, LinkedIn, YouTube, Instagram…Jelly?!) to thrive. I remember when I built my original profile on thefacebook.com. I’d known about “the Facebook” for a little while, but I had to wait for my .edu email address to sign up. Yeah..remember that? When only college students could sign up?? Back then, I used it for the basics: posting pictures and finding out if my fellow classmates were single (I sort of don’t want to admit that). It became the first stage of profiling, even before the exchange of numbers for old-school texting. Soon it was event central. If you were having a party at your dorm, you were definitely making a Facebook event and inviting all of your friends (well…maybe not all of them). It wasn’t until my sophomore year that Facebook finally launched their Newsfeed. Yes, I’m serious…there was a Facebook without the feed…which I, at the time, checked probably 17 million times a day. Fast-forward four years, and Facebook (& Twitter & YouTube & LinkedIn) had become a mainstay of my job, even though there were no classes about it in my undergrad advertising program. The marketing world was changing while I was in school, and by the time I had my first “real” job, social was the topic of conversation for CMOs across the country. Four years…that’s it. By the time Timeline was introduced in 2011, small businesses and huge marketing companies alike knew that social media (not just Facebook), could not be ignored. And it’s not because it was another outlet to shout at consumers, it’s because consumers were now growing up, as I had, with social media. 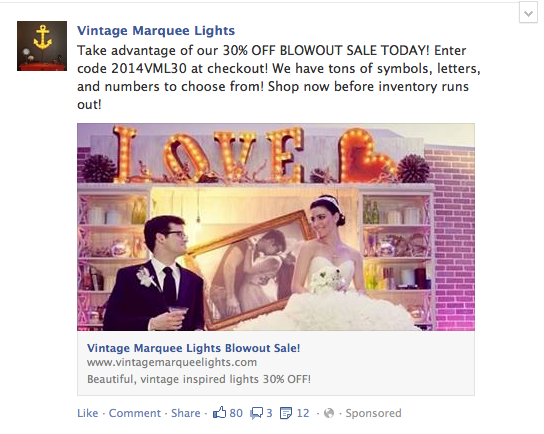 It was not only a part of our everyday, but Facebook was now a part of our story. Sure, there are still significant negative associations with social networks (privacy risks and big data are a few), but I challenge you to consider the significant strides we’ve made since Facebook gave social media its popularity. Family, friends and brands are able to connect and converse (like actually converse) with each other, while also communicating with an entire circle of people, so that it’s not just one conversation, but it’s one and many simultaneously. We’re able to remember the important things happening in each other’s lives and feel connected, even if we haven’t seen or heard from someone in years. So I’m sappy. But Facebook is one of my oldest friends and I interact it every single day, multiple times a day. So, to me 10 years is a big deal. And I’m anxious to see what will happen in the next 10. What’s your first memory of Facebook? If you’re interested in a little more Facebook history, check out this infographic by Inside Facebook. This entry was posted in Facebook, Just for fun and tagged Facebook's 10th birthday, thefacebook.com. 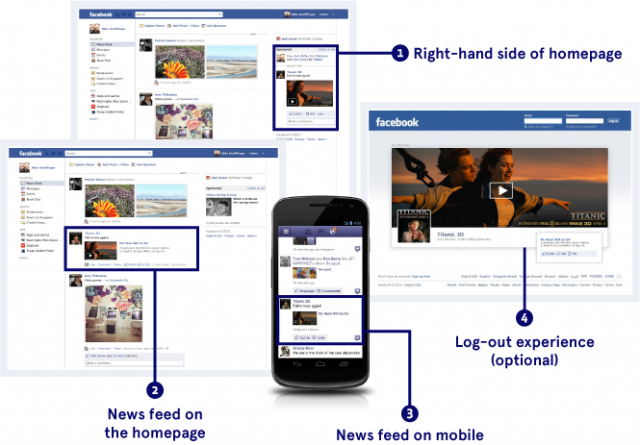 Facebook Timeline – finally here! The Facebook Timeline is finally unrolling for everyone to enjoy – or not enjoy as the case may be. If you’re looking for some help setting up your timeline and learning about the new interface, you’ve come to right spot. This post goes into detail about the new look and feel of the timeline. Remember, you get a chance to go through all your posts and delete, or change privacy settings before publishing your new timeline. This is an important step towards making sure your timeline is just how you want it to be for the public and for your friends. These have been around for a while now, so you should be very familiar with them. Be aware that when you de-friend someone, they automatically become one of your subscribers, so make sure your subscription settings are set up the way you’d like them to be. Some of the new open graphs applications are pretty cool. Others think they’re a bit creepy. For a more visual and easier presentation about the new Facebook Timeline check out my Slideshow about the new Facebook timeline. This gets a little more into detail about the implications of this new timeline for brands. This entry was posted in Facebook, Social Resources. Raise your hand if you stream via Netflix, listen to music on Spotify, or read the Washington Post. Now, raise your hand if you’re busy. Facebook’s new streaming apps are going to give you one central access location for all of your favorite entertainment services. Facebook is positioning itself as a destination, where users can record their own history via the new Timeline, share with their friends via the Open Graph, and now users can watch films, listen to music, and read newspapers without leaving the site. Clearly, Facebook wants us to stay on the site for as long as possible – the longer we stay, the more ads we can click on! Also, Facebook will be capturing vital information about what movies or tv shows its users are discussing, creating a huge opportunity for services like Hulu and Netflix. But, Zuckerberg has been pretty clear that the goal of the site is to be a “distribution platform” to other media companies and that these apps will help users stay more closely connected to their friends. Once users have opted in to open graph, these new apps will be able to automatically share activity such as viewing, listening and reading in the new “ticker” stream to the right. Now, without ever leaving Facebook, I can listen to what my friend is listening to or cook something my friend is cooking. So, what are the apps you can look forward to? Spotify: If you’re not familiar with this, it’s a free music streaming company much like Pandora. With the new app, you can see what your friends are listening to, and hit play to hear their tracks instantly. So let’s introduce music to your social life. Foodily: This is one of my favorite recipe search engines. Their app gives you a dedicated, real-time feed of the recipes your friends save on the site and allows you to see your friends’ recipe boxes. When you save a recipe, the friend who initially shared the dish is notified. Kobo: I hadn’t heard of Kobo until the Open Graph (I guess this just shows you the power of the new tool). Kobo is a Borders-backed company that was the first of the major e-readers to add a social element to reading. This app will point out of two friends are reading the same book or post interesting facts about a reader’s activity on his or her wall. Washington Post: The Washington Post and the Daily, News Corp.’s national digital publication are pioneers for social news and will allow readers to instantly share the stories they find interesting with their friends. I assume many publications will follow. Netflix: Netflix said subscribers outside the United States will be able to share what they’re watching with friends on Facebook. Now it will be easier to find new television series or movies. Unfortunately the Netflix app won’t be available for the US, because of privacy laws around movie rentals. But, I’m sure another company will figure this out. 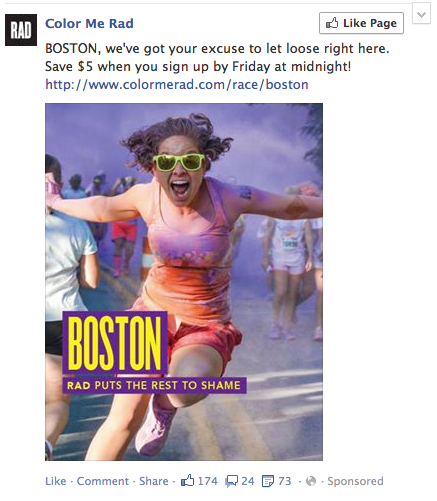 Nike+: Facebook is also rolling out “lifestyle” apps that let users share routes they are running, or going to events (Eventbrite). The Nike+ app can show your running route to friends. This entry was posted in Facebook and tagged entertainment hub, facebook, Kobo, open graph, Spotify. Do you remember your first subscription? I’m pretty sure mine was either Highlights or National Geographic Magazines. Fast forward about twenty years. Now I’ve got subscriptions to my google reader and to the digital versions of Food + Wine Magazine. As of last week, we no longer just have the ability to subscribe to published works. Now we can subscribe to people’s status updates too. Facebook is responding to the praised privacy controls that Google+ has employed by allowing you to have greater control over who gets access to your updates as well as more control over what updates make it to your feed. With the new subscribe button you have the ability to curate what types of updates you see from each of your friends and how often you see them. According to Facebook’s blog you can chose: All updates (everything your friend posts), Most updates (the amount you’d normally see), or Important updates only (just highlights like a new job or move). Not only can you chose how often their updates make it to your feed, but you can chose which of their updates you see. Maybe you really don’t want to know that one of your friends just played Farmville and you only want to know when they post pictures. You have the control. These settings are going to be even more important as more “open graph” apps are available and you’ll be updated on what music or movies your friends are listening to or watching. You also have the ability to subscribe to people who you’re not necessarily friends with so that their updates show up in your feed. This means you could subscribe to celebrities, journalists, political figures or “interesting people” as Facebook calls them. Do remember, though, that everyone has control over which updates are shared to the public, to their friends etc. If your status update is public, your friends and your subscribers will have access to it. Conversely, you might have friends who you don’t subscribe to so that you don’t see any of their updates. Now that the subscribe button has been out for a little while, how do you think it will change your interactions on Facebook? This entry was posted in Facebook and tagged Facebook subscribe button, subscriptions. I’ve already signed up for the new changes so that I can tell you all about it (if you want to start playing with your new facebook profile too, click here). 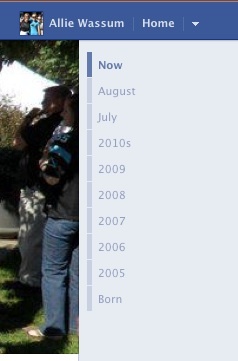 Basically your entire life on facebook will be in a timeline format. All of your photos, updates and experiences with apps will be shared on it in chronological order. You’ve probably heard the buzz about Facebook’s recent Spotify acquisition. Basically, they will have new “open graph” apps for gaming, movie streaming, music streaming, etc. Every interaction you have these apps will become updates on your new profile. This means that all of your friends will see what you’re currently listening to, playing, or watching. This sharing is extremely passive, so you should be careful which apps you authorize, because once you add them to your timeline, you don’t have to explicitly give it permission to add stuff to your feed, it happens automatically. More importantly, what does it look like? 1. You’ll get to choose the “central” photo, which spans the entirety of the screen. Gone are the days of the small box in the left-hand corner. 2. Links to see all of your friends, photos, maps, Likes, apps etc. will be just beneath this photo. 3. To the extreme right will be an aggregate timeline with years to help you and your friends navigate your timeline. 4. Below this will be your Facebook “activity log”. This includes your latest updates, photo uploads, and top stories. You do have a little control over what’s featured most predominantly. You can click the star to expand a story, or you can click the pencil to hide a post. As you know, you’re able to decide who you want to share each update, photo, post with. You’ll be able to do the same with the new format. You can even add significant events to your timeline, like surgeries and graduations! However, you might be concerned about posts from the past. Every entry has a drop down menu next to it that lets you filter who can see this item. If you don’t want to go back to the beginning, so to speak, you can manipulate this within your privacy settings. Simply make all previous posts private to your friends or whoever you chose. I really like this new feel, but there’s already been a lot of backlash. Look at this from Facebook’s perspective; they’re a business, they want you on Facebook all day long and they want data…data…data. Keep in mind you’ll be able to add things like when you broke a bone or hit a significant milestone. Think how much you’ll be giving them with this new timeline. This is GOLD for advertisers. Click here for Part 2: Subscriptions. This entry was posted in Facebook and tagged New Facebook, Timeline.